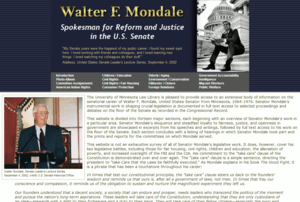 The University of Minnesota Law Library is pleased to provide access to an extensive body of information on the senatorial career of Walter F. Mondale, United States Senator from Minnesota, 1964-1976. Senator Mondale's instrumental work in shaping crucial legislation is documented in full text access to selected proceedings and debates on the floor of the Senate as recorded in the Congressional Record. 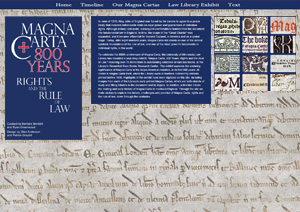 To celebrate the 800th anniversary of Magna Carta, the University of Minnesota Law Library has digitized its year-long exhibit, "Magna Carta, 800 Years: Rights and the Rule of Law," including over 75 items from its outstanding collection of rare law books, held at the Library's Riesenfeld Rare Books Research Center. The exhibit explores the enduring significance of Magna Carta in the Anglo-American tradition, in its first 800 years. The University of Minnesota Law Library is pleased to provide access to an extensive body of information about the great American jurist Clarence Darrow. 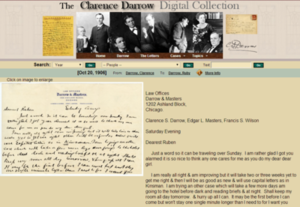 The site includes an extraordinary collection of personal letters written by and to Clarence Darrow. These letters include correspondence with Darrow's family members as well as with many other prominent individuals who influenced the development of American law during the first half of the 20th Century. In addition, the site has sections focused on both Darrow's famous and lesser known trials. 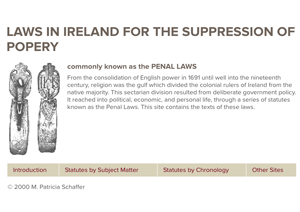 From the consolidation of English power in 1691 until well into the nineteenth century, religion was the gulf which divided the colonial rulers of Ireland from the native majority. This sectarian division resulted from deliberate government policy. It reached into political, economic, and personal life, through a series of statutes known as the Penal Laws. This site contains the texts of these laws. 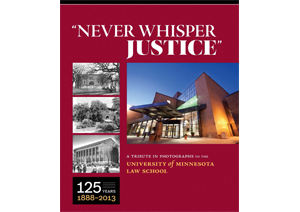 This commemorative volume features narratives and photographs documenting the history of the University of Minnesota Law School's first 125 years from 1888  2013. The book is structured around the tenures of the Law School's first ten Deans  Dean William S. Pattee to Dean David Wippman. The book's title comes from Professor Donald G. Marshall's eloquent advice to "Never whisper justice." 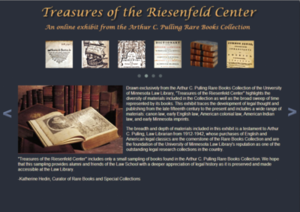 Drawn exclusively from the Arthur C. Pulling Rare Books Collection of the University of Minnesota Law Library, "Treasures of the Riesenfeld Center" highlights the diversity of materials included in the Collection as well as the broad sweep of time represented by its books. This exhibit traces the development of legal thought and publishing from the late fifteenth century to the present and includes a wide range of materials: canon law, early English law, American colonial law, American Indian law, and early Minnesota imprints. 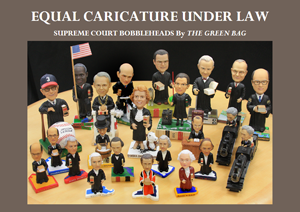 The Supreme Court bobbleheads, figurine likenesses of past and present Supreme Court justices, have become prized collectibles. Produced by The Green Bag and its editor, Ross Davies, they have delighted the bench and bar since 2003. The University of Minnesota Law Library has now digitized its 2016 exhibition of these bobbleheads, featuring a complete collection donated to the Library by the Hon. James M. Rosenbaum ('69), United States Federal District Court Judge for the District of Minnesota (ret. ).